Using almost no scenery, this easily produced yet powerful play explores the mind and experience of a high school girl who inadvertently gets into drugs. It involves your actors and your audience in some real problems, doing so in an entirely constructive way. The lesson inherent in this play is so effective because it is not the result of a lecture but, rather, a sharply visualized tragedy that happens to a member of the peer group. "A raindrop just splashed on my forehead," Alice wrote in her diary, "and it was like a tear from heaven. Am I really alone? Is it possible that even God is crying for me?" Alice is a fairly typical girl from an average family with parents who love her. What makes Alice different is that she's tricked into trying drugs and then becomes addicted. She fights against her addiction, but by the time she has learned the answers, it's already too late. 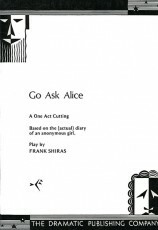 "Go Ask Alice was a resounding success. It was simple to stage, yet the action carries the play's powerful theme. My students enjoyed the challenge of this drama." "Excellent script with a great message. The script allows for great impact with a minimal set. It also allowed the set to be adapted to my space at a school. 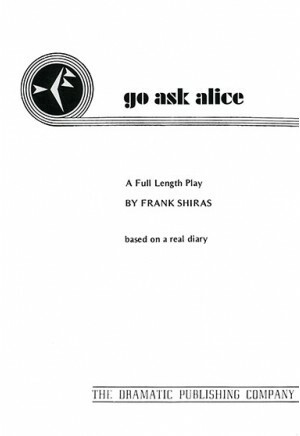 Go Ask Alice stays very true to the diary while bringing it to life in a visually impacting way." "Very relevant and age appropriate. Deals with relevant issues in a creative, fun way. Script allows for plenty of creative set pieces, movement pieces, costume and music additions. The students had a great time with this one." "Having a two-sided set worked well for switching between San Francisco and Alice's room." Tip by Nichole Mohr, Vaughn International Studies, San Fernando, Calif.